Originally an active Military Fort, built in 1779, to protect the city from invasion via the Lake, this area later became an entertainment district filled with amusement parks, restaurants, camps, and jazz. Spanish Fort is located near Robert E. Lee Blvd. and Bayou St. John. This was where the lakeshore began before the massive land reclamation project during the 1920s & 30s which resulted in subdivisions and Lakeshore Drive. 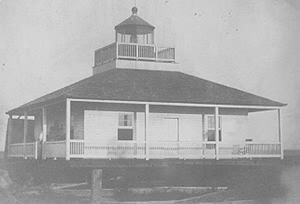 The photo shows the now defunct Bayou St. John Lighthouse. Located at the lake and Bayou St. John, Spanish Fort is now quite far from the shoreline due to massive land reclamation during the 1930's and 40's. Looking at the map, all land north of Robert E. Lee Blvd. was "reclaimed" from the lake. 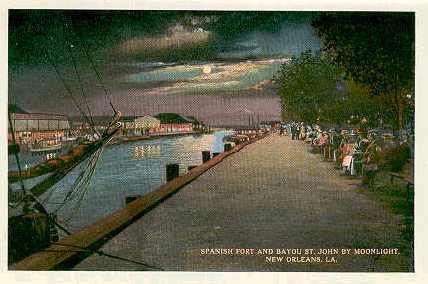 The fort originally bordered the shoreline of Lake Pontchartrain. When the fort was no longer needed, the land was sold to an amusement park vendor who renamed it Spanish Fort. 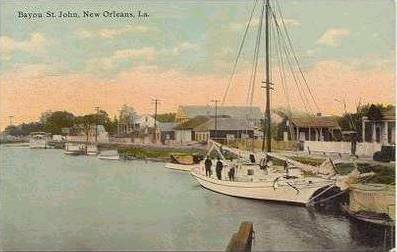 Later this became the 1st location of Pontchartrain Beach Amusement Park. Because of this, many old timers called Fort St. John/Spanish Fort "The Old Beach". It's history is long and interesting. In 1812, New Orleans became part of the United States after the Louisiana Purchase. The wealthy spent their leisure time on the lake shore at several exclusive resorts, eating at the famous restaurants, gambling and enjoying the lake breezes. The first resort to open is at Spanish Fort at the mouth of Bayou St. John. During its heyday as an amusement park, from the 1880s to the 1920s, Spanish Fort faced stiff competition from its nearby rival, West End. Although Spanish Fort had brief moments of grandeur, sometimes proclaiming itself to be the “Coney Island of the South,” the flood-prone park frequently fell on hard times, while West End prospered. In 1903, streetcar service to the park was discontinued. Ownership passed to the same streetcar company that operated the rival park, but Spanish Fort would never attain West End’s fame or grandeur. Spanish Fort closed in 1926.